I could sit and watch funny cats on video for hours and I did. I went through you tube and found the most outrages feline funny videos on their huge web site. I picked only the videos that no animals or people where harmed in the making of. Only light funny and cute clips made the cut and they are suitable for all age groups. This is a family friendly page and to my surprise some of the ones on the net are in bad taste and some are wrong in the way they treat animals. However, these clips are hilarious and entertaining without crossing over to the dark side. If you find any feline super hero videos you think we should add, you can contact us from the form on the bottom of the cat books page. Just send us the URL of the video and we will check it out! Some of these videos where first seen on Americas funniest home videos all about cats show. They have been remixed and posted for our enjoyment on the video sharing website. These quick clips are set up to play right here on this page with no redirection. The 4 videos play one right after the other so just start the first video and sit back and enjoy. The total run time of the short clips and the other clips is about 7 minutes. The video stops automatically after playing the last clip. You can skip around and replay your favorites by clicking on any of the four video buttons on the lower border. This video is from Daisy the curly cat. She is a Devon Rex cat that is super special. She and her Momma have a relationship that allows them to do things that other pets and their humans would never think of doing. Daisy’s mom is super creative and makes some really great well thought out videos. So here is one of my favorites where daisy gets hooked on Catnip after the first encounter. We can all relate to this one. Here is my son Thomas on his favorite kitty chair. The boy loves batman! This is one of Tommy’s favorite places to sit and watch the world go bye. 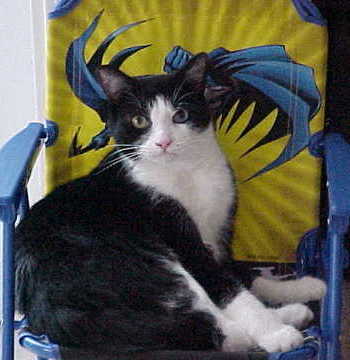 The chair is made for children up to 4 years of age so Tommy has another six months before he is just to old to use his super hero cat chair. A new area has been added were people can share their special pets and their odd behavior. Cats can do some weird stuff. I dedicated a page to just the strange things pets do. Post your own stories and pictures, or just comment on the ones already there on the weird cat behavior page and get involved. Help Thomas’s funny cat website grow with a bookmark or share.